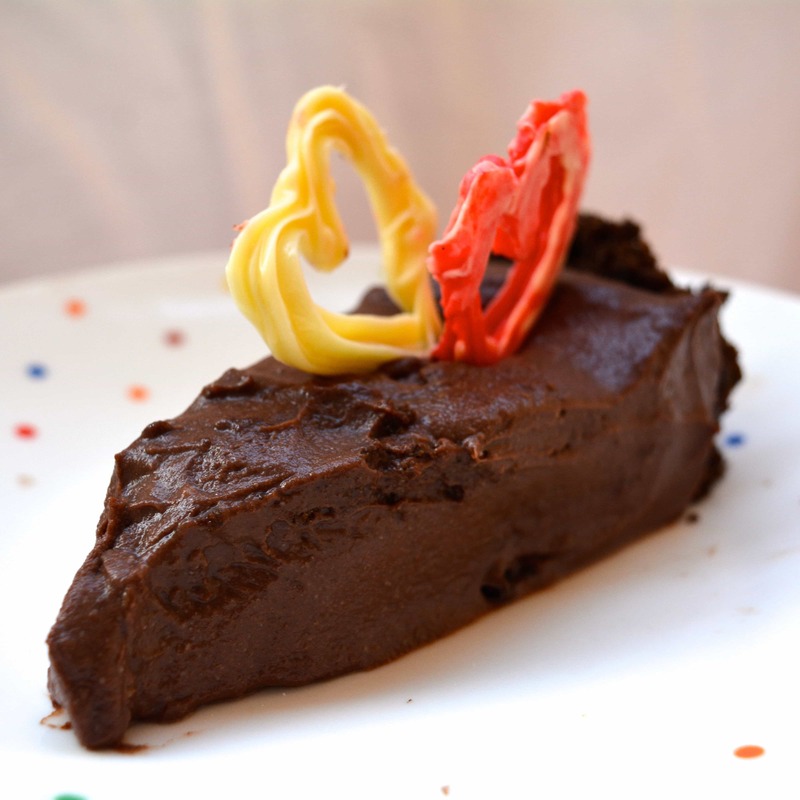 Vegan Chocolate Silk Pie - Chocolate Chocolate and More! Feeling guilty about overindulging during the holidays? Not to worry. Vegan chocolate silk pie is so rich, creamy, and chocolaty that you’d never guess it is vegan, high fiber, and full of iron. Vegan chocolate silk pie is just as dreamy as the versions made with butter, cream, and eggs but with much fewer calories and fat, and it only takes 10 minutes to make. You can also make it gluten-free by choosing gluten-free cookies for the crust. I am an Orthodox Christian which is a bit of a mystery to most folks. I raise this because there are times of the year when we fast from certain foods and our diet basically becomes vegan. Lent is our longest vegan fast. Including Holy Week, it lasts 7 full weeks. As a meat eater and dairy lover, going vegan is pretty tough. It may be good for my soul and my body but after a few weeks, I find myself missing meat and dairy so I’m always on the lookout for comfort foods that won’t make me feel guilty. 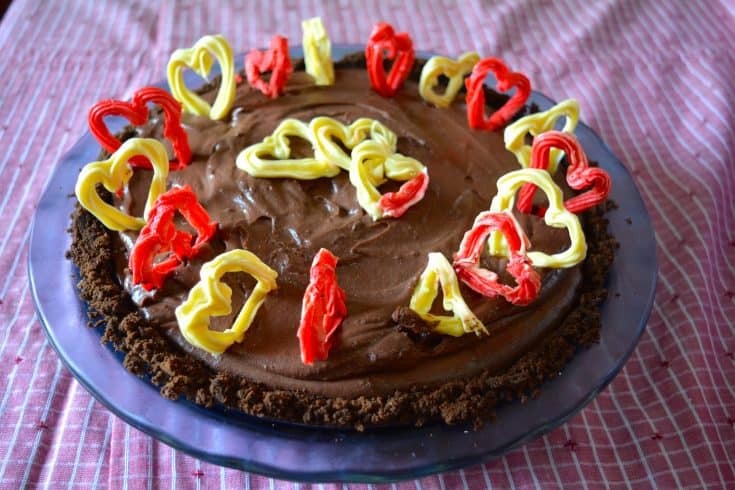 Vegan chocolate silk pie is one of them. A few years ago, someone brought a chocolate silk pie to church coffee hour. This pie had a graham cracker crust filled with a smooth, dark chocolate mousse. It had been weeks since I’d had anything that inviting so of course I grabbed a slice. It was so incredibly creamy and decadent that I was sure I was cheating on the vegan diet. I’d never had a decent vegan dessert before. Usually vegan desserts have strange textures and less than appetizing flavors. I found the baker and just about fainted when she told me her secret…. The pie was made with semi-sweet chocolate chips and tofu. I’m sure your response is similar to mine. Tofu? That stuff is disgusting! I pick those rubbery blobs out of Asian dishes. Surely she must be joking. How on earth could you transform a sponge into smooth, rich chocolate mousse? After serious effort to repress my gag reflex, I asked how such a delicious pie could include tofu. She informed me that the Japanese make a soft, creamy tofu. It’s called silken tofu and it can be used as a healthy substitute in many dishes to give a smooth texture. I looked up silken tofu and found that the Japanese use a different process than the Chinese to make tofu. Japanese tofu isn’t pressed and the curds and whey aren’t separated so it has a smooth, very moist, custard-like texture (much like flan) as opposed to the more grainy, spongy, solid texture of Chinese tofu (for more info check out this article on theKitchn). Well, I couldn’t deny the pie was amazing and I’ll do anything for chocolate mousse during Lent so I decided to make my own version. The first task was finding tofu in the grocery store. Since I’d never looked for it, I had no idea where to begin. Turns out, tofu is kept in the refrigerator case in the vegetable aisle. Then I needed to sort through the varieties. American grocery stores tend to have a fairly wide selection even though tofu is not hugely popular. Silken tofu comes in different degrees of firmness, I use soft or extra soft silken tofu. Ironically, here in Cambodia, tofu is not labeled as “silken” so I settled on a Japanese brand of soft tofu for my vegan chocolate silk pie. 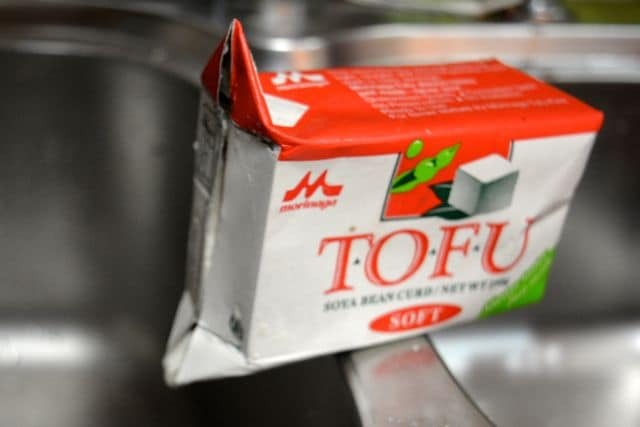 Be careful – Chinese tofu also comes in extra soft and soft varieties too but it’s the spongy stuff with a stronger flavor. The key is the word “silken” or “Japanese.” Blocks of tofu are stored in liquid so it’s important to drain the tofu before you use it. 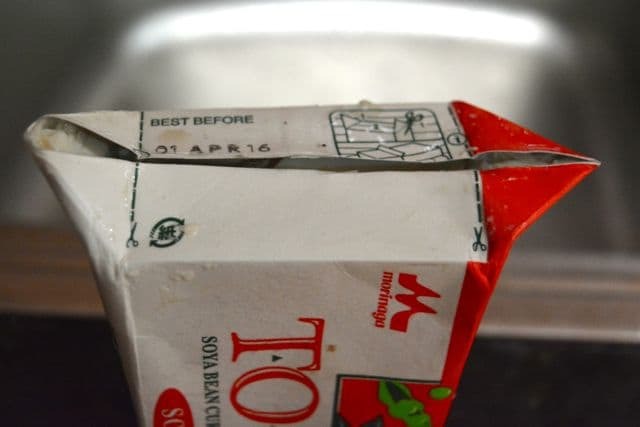 Silken tofu is so soft that it’s best left in its original container to drain. I cut a slit in the top of the box and then turn the box on it’s side and just let it rest on the edge of my kitchen sink. Still skeptical? I would be too. Like I said, if I hadn’t eaten a slice first, there is no way I’d have bothered with this recipe. 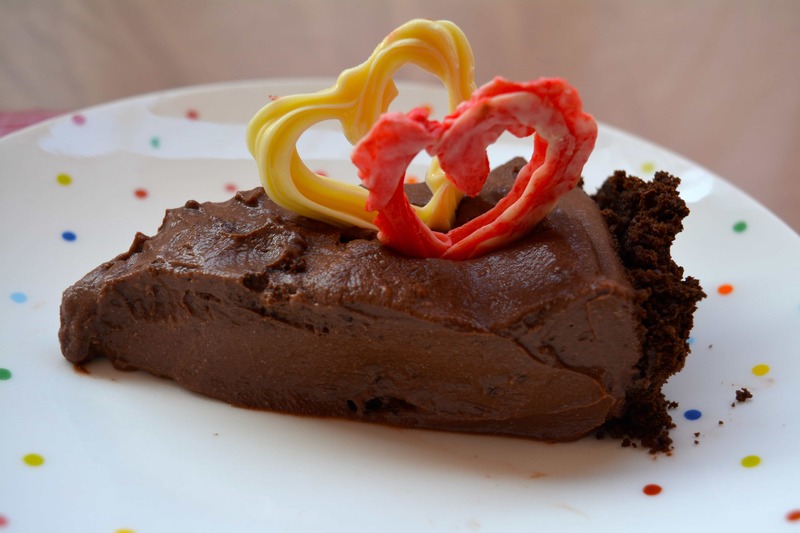 If you are curious (or maybe courageous is better here) but don’t want to invest in a whole pie, just make a small amount of the filling and serve it as chocolate mousse. Use 1 box of silken tofu (find the smallest one you can) and an equal amount of melted semi-sweet chocolate chips. Beat the tofu and melted chocolate together with a mixer until smooth and refrigerate. Taste and see how amazing it is! You’ll then go back and make a whole vegan chocolate silk pie. Vegan chocolate silk pie is so rich you’ll only need a small slice — unless you’re like me and can’t resist seconds. I looked up nutrition information on the filling (the crust depends on the type of cookie and shortening you use). Here are my estimates based on the package nutrition information for a slice that is 1/16 of the pie: 241 calories, 5 g protein, 72.5 mg fiber, 14.5 g fat, 56.44 mg calcium (5% DV), 2.06 mg iron (11% DV). Put cookie crumbs and melted coconut oil in a pie pan and mix until the cookie crumbs are moistened. Use a spoon to press into a pie crust and refrigerate while you make the filling. Drain excess liquid from the tofu. I cut a slit in the box and drain the liquid before opening the box all the way up. Put tofu and melted chocolate in a large mixing bowl. Beat on high until the ingredients are fully blended and smooth. Pour chocolate mixture into prepared crust and refrigerate until firm (about 1 hour). I garnished with white chocolate hearts but strawberries also work well. Serve chilled. 16 servings. Sometimes semi-sweet chocolate chips don't melt well (particularly if you use generic ones). If your chocolate chips don’t melt into a smooth liquid, add up to ½ cup of cooking oil (canola works well) and heat gently. You can also serve the filling in chocolate cups as chocolate mousse. Thanks Aimee. It is surprising how tasty this is. I hope yours comes out well! Vegan or not, this pie looks amazing!! I’ve had mousse made with tofu before and it was delicious, nobody could ever guess what the secret ingredient was!! I’ll have to give this a try!! I have lots of friends who are Orthodox! I’m so happy that you discovered this pie-it looks so amazingly luscious and delicious! I hope you do. Let me know how it comes out!